ACC singers Estella Ramirez, Philip Castro, and Victoria Morse – Photo by Moloshok Photography, Inc. This holiday season enjoy a stunning choral exploration from the acclaimed Angel City Chorale that features Classical, Traditional, Spirited Contemporary, and Gospel R&B. In addition to popular American Christmas carols, you will experience African, Chanukah, Celtic, Medieval, Beatbox, Pop, and British vibes – all presented in full voice. The diversity of the program represents the rich tastes and talents of the choir. Angel City Chorale (ACC), the celebrated Los Angeles choir led by Founder/Artistic Director Sue Fink, will jump-start the festive season in style with Bring on the Joy, the choir’s 23rd annual set of holiday concerts and sing-alongs during the first weekend in December. The festive evenings will bring together talented Los Angeles-area singers and instrumentalists with a tapestry of seasonal favorites featuring musical textures from diverse traditions. The inclusive, family-friendly concerts will take place at Wilshire United Methodist Church in Los Angeles over two very special nights on Saturday, December 3, and Sunday, December 4, 2016. Tickets range in price from $22 for children to $75 for VIP packages (see details below). The performances start at 7:00pm and include a 15- minute intermission; a dessert reception follows each performance. For additional information on ACC, please visit their official site here. 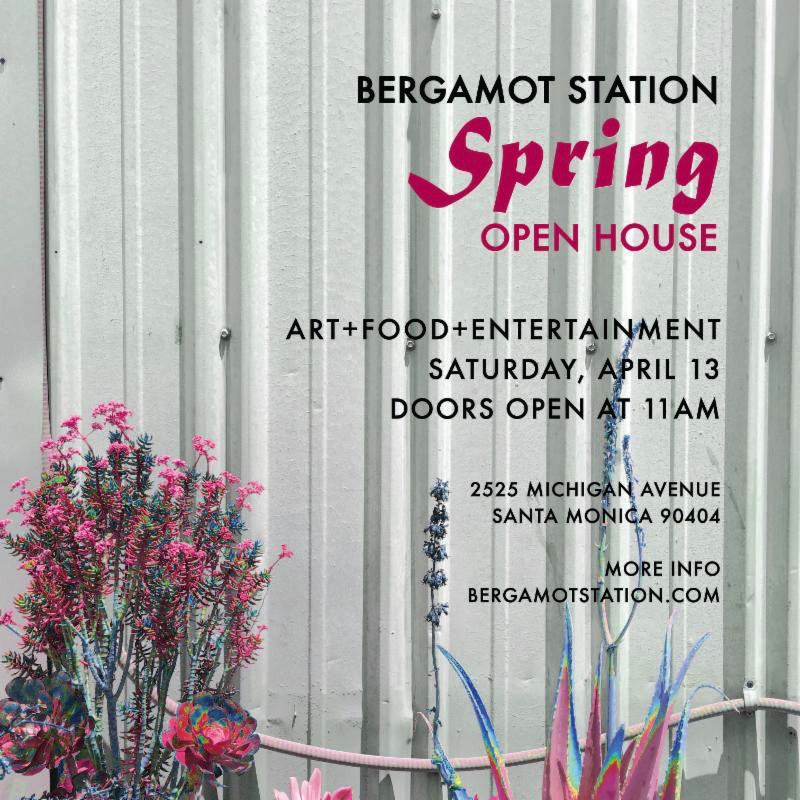 The vibrant performances, a reflection of Los Angeles, feature a 25-piece live orchestra and an array of seasonal favorites with musical textures from diverse traditions. Audiences will also get the chance to sing with the lively 160+-member choir on familiar songs during the popular and diverse sing-along. Angel City Chorale – Photo by Mel Stave. • All are welcome at this non-denominational event. 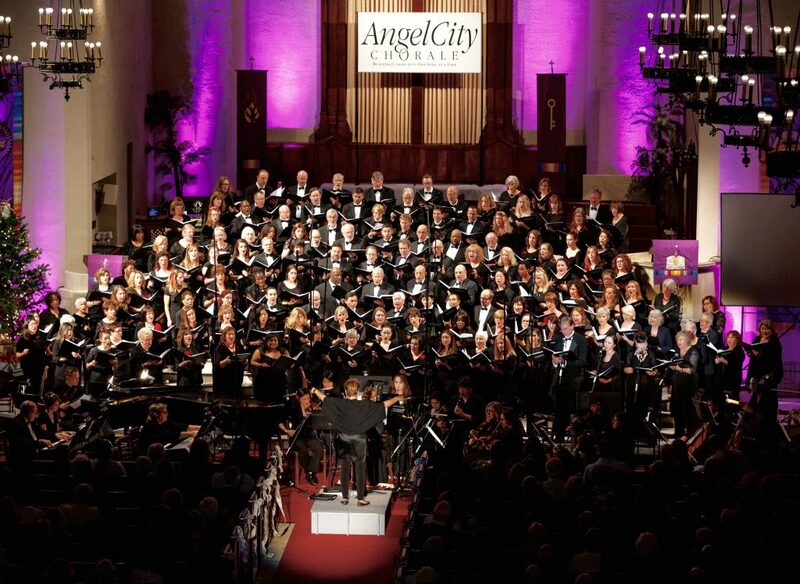 Angel City Chorale, conducted by Founder/Artistic Director Sue Fink, is a multitalented, multicultural group of 160+ men and women that truly reflects the spirit of Los Angeles, the city it calls home. Formed by Fink in 1993 at the world-famous McCabe’s Guitar Shop with just 18 singers, the choir offers a diverse selection of musical material including Classical, Jazz, Folk, Gospel, Rhythm & Blues, and more. 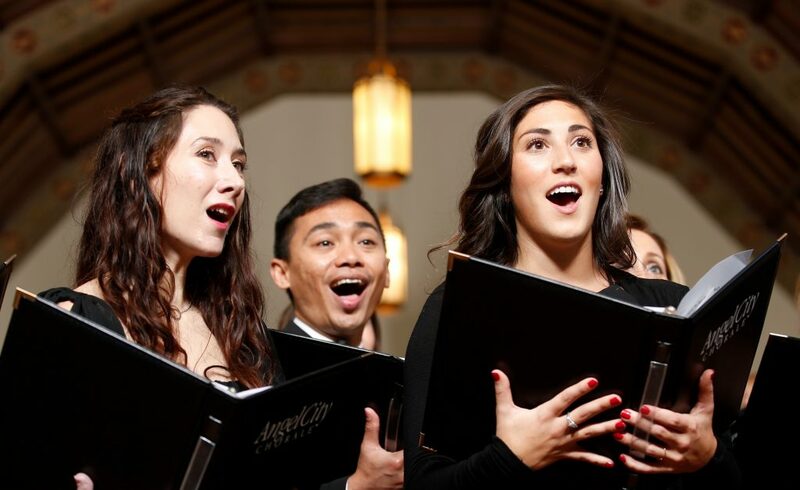 ACC performs two concerts seasonally, in spring and winter every year, to standing-room only crowds at the historic Wilshire United Methodist Church.